Pineapple Kush is a popular strain of marijuana that is mainly bred by Royal Queen Seeds. It is a beautiful cross between two all-time legendary cannabis favorites – Master Kush and Pineapple. The result is, of course, a plant that looks, tastes, smell and smokes amazingly well. The THC content of this strain is mild, between 10-15%, but is a great casual smoke for those who want to relax and chill without being blown away by a high THC count. The buds are a mix of brown and green with orange hairs sticking out. Pineapple Kush is a 70% Indica dominant strain with an obvious taste of Pineapple. The downside of Pineapple Kush is that it is very difficult to find this strain and seeds are quite rare. It can be found in a few medical dispensaries in Southern and Northern California, and not much anywhere else. One of the most attractive aspects of the strain is its sweet taste. While being quite heavy on the pineapple it has been described as having some light mint or vanilla flavor. Smokers have detected notes of caramel amongst the tropical aroma – the fruity scent of this strain is rather strong. What is surprising about Pineapple Kush is that most users describe its cerebral effects as opposed to the Indica results, despite it being 70% Indica dominant. Why do Patients Use Pineapple Kush? 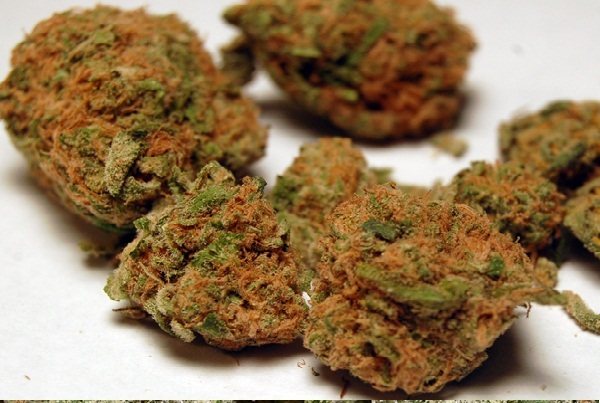 Despite a mild THC content, Pineapple Kush is still effective for the treatment of insomnia and eating disorders. Patients can expect to feel tired and hungry quite fast when smoking this strain. Pineapple Kush also has a moderate cerebral effect which can make it effective for the treatment of stress and anxiety. A cross between Pineapple and Master Kush. Pineapple Kush has a rating of 8.9 on the stoned meter. Pineapple Kush has a moderate THC range between 10-15%, though some reports the numbers can reach as high as 17%. The strain requires between 63 and 77 days to finish flowering. A strain that does well both indoors and outdoors. Needs a mild climate to thrive. 70-120 cm indoor, 120-180 cm outdoor. Pineapple Kush has a high yield. 550 grams per square meter. Pineapple Kush requires moderate growing skills. Susceptible to mold and mildew. Plants need support during the flowering stage.